As a grad student, I personally know the meaning of the phrase "starving student" (peanut butter and jelly for dinner, anyone?). So, I'll be the first to admit that far too many natural product lines fall into a luxury price range. Due to popular demand from my readers, I'm going to start featuring affordable products in Budget Edition posts! 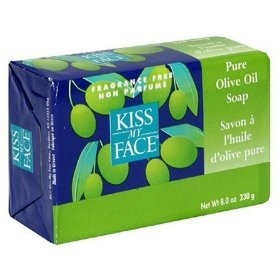 First up is Kiss My Face Pure Olive Oil Soap. If you've been using Dove, this sucker is three times less expensive! This soap bar is 4oz and only $2.99. But if you want an incredible steal, you can get the 8oz bar for $3.99. And to add convenience to savings, this bar soap is available at your local Whole Foods. The ingredients in this bar are simple and safe. It uses a gentle cleanser, saponified olive oil, to clean your skin without stripping it. If you use it at your bathroom sink, you'll begin to notice that your hands will need less lotion. With the winter months looming, you'll appreciate eliminating harsh soaps that zap moisture all the more. I only have one caveat. Many of the other Kiss My Face bar soaps contain synthetic fragrance, which you want to avoid. The only two without this ingredient are the pure olive oil soap bar, and the green tea and olive soap bar. Stick to these two, and you're golden. Saponified Olive Oil, Water, Sodium Chloride.